Ok this is like the cutest lip balm packaging, but the lip balm itself was sorely disappointing. I bought a bunch of different flavoured ones from the US as souvenirs to friends and sorry if you're reading this I hope your balms applies smoother than mine lol. It feels like candle wax on my lips - dry and paraffin-ish. The scent is Dr Pepper alright but more of a lingering taste on an empty cup that used to contain Dr Pepper... and it's got too much sweetener. Oh and the ingredients - nothing much natural! I think I'm used to the handmade yummy balms from Etsy... so get this only if you're a sucker of nice packaging (like me) haha! they should try bee wax or and see if it works for them, and I’m sure it will work for them..
well i will still like to try it i love dr.pepper. 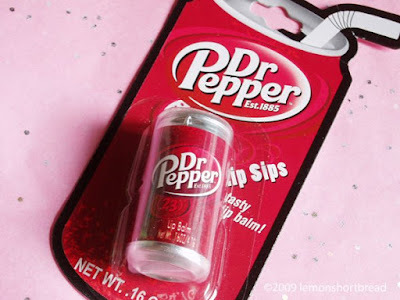 well i tryed it and i love it .it even smells like dr.pepper .the one i got is not in a can its in a tube from lip smackers. and its the cap sick one .